Did you know Easter is set each year by the moon? Easter is celebrated on the first Sunday after the full Moon that occurs on or just after the vernal equinox (spring). This full Moon is also called the “paschal full Moon". The first full moon in Spring sets the date for Easter and from there we back up Ash Wednesday 40 days earlier (not counting the Sundays in Lent) to set the date for the beginning of Lent. 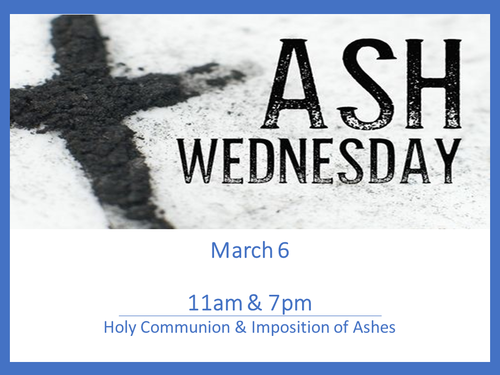 Ash Wednesday March 6 - Our Lenten journey begins on Ash Wednesday, March 6. We hope you will join us for either the 11am or 7pm service. Both will have the "imposition of ashes" and Holy Communion.